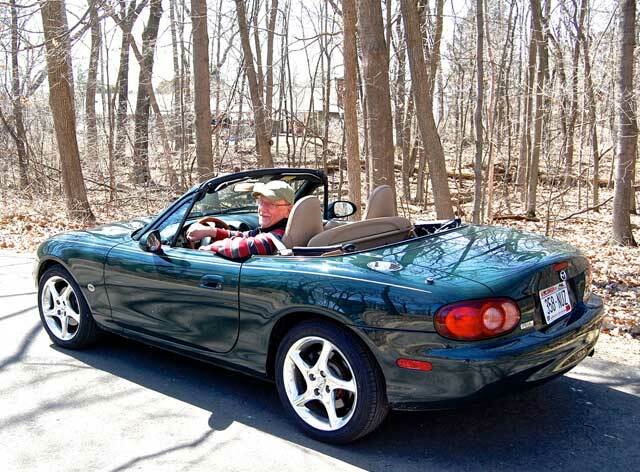 Congratulations to Marty on the selection of his 2001 SE as our Featured MX5 Miata! It was some eight or nine years ago that I was wandering around the car corral at a summertime car show in Jefferson, Wis., and laid eyes on a red 1992 Miata. I lingered there for a time admiring it and thinking about the possibilities. 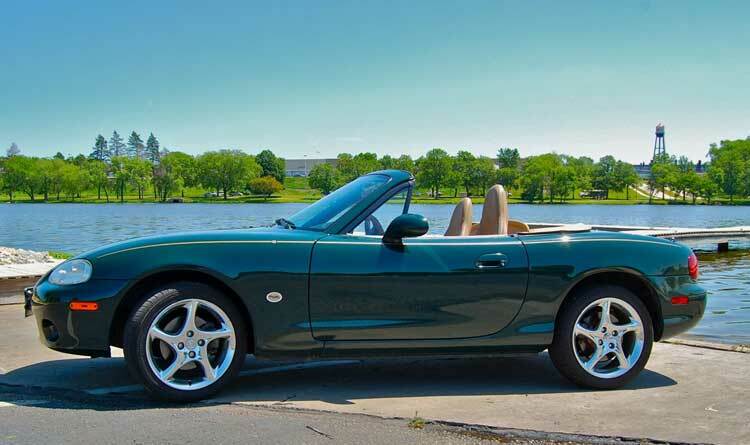 It was exceptionally clean and fairly low mileage but the owner wasn’t very flexible on his price and, besides, I had never given any thought to buying a Miata before. I left the show that day without the Miata but somehow I couldn’t get it out of my mind. I saw the same car again – twice – at car shows the next season. The owner was no more willing to negotiate than he had been before, making me wonder why he went to the trouble of offering it for sale in the first place. On the other hand, I still was only half serious about buying one of these little roadsters, and wasn’t sure I would want an NA version if I were serious about it. Still, the experience kindled something in me and no matter how I tried to extinguish the flame, it kept relighting. 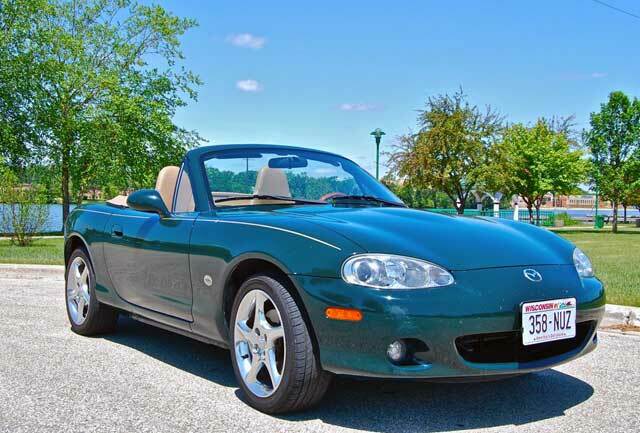 Over the next year or so I looked at several Miatas and seriously contemplated making room in my garage for one. Each time, though, I would back away with my wallet still in my pocket and that space in the garage still empty. Until one September day six years ago. 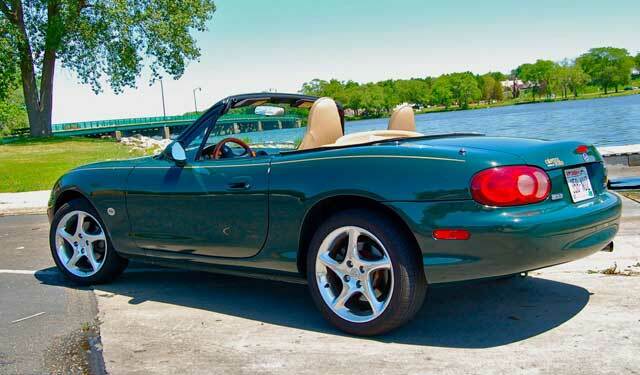 An online search had turned up a green 2001 Miata SE at a dealer in Madison, Wis., fifty miles away. The following Sunday my wife and I went for a drive and found ourselves in the dealer’s lot looking over the car. Car dealers aren’t allowed to operate on Sundays in Wisconsin so we were able to check it out undisturbed and, as a bonus, someone had left it unlocked. The car was remarkably clean and the odometer showed just under 50,000 miles, an average of about 7,000 miles a year. Obviously, past owners had driven and enjoyed it but they had also taken good care of it. I would only be using it in the summers so I figured that if I took the same care that its earlier owners had, it could last me a long, long time. Try as I might, I couldn’t talk myself out of it this time. I didn’t fully appreciate the significance of the SE designation until after I had bought it. 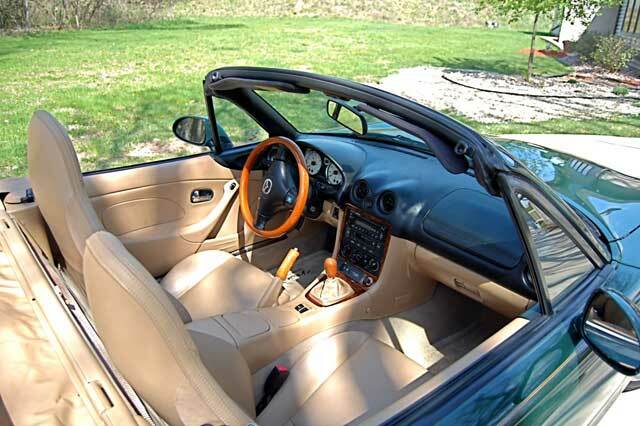 Mazda offered various special versions of the Miata from time to time. 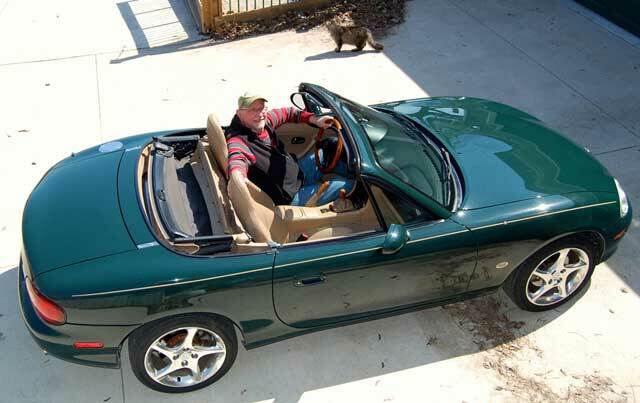 For 2001 they called it the SE (Special Edition) and all of them were painted British Racing Green, had tan, perforated leather upholstery, tan tops, shinier wheels and real wood Nardi steering wheels, shifter knobs and brake handles. They also came with a 6-speed manual transmission rather than the standard 5-speed. Mine was the 2905th out of 3000 built. I could only drive it for about two months that first year but it got plenty of use the next summer and secured a special place in my late wife’s affections. That summer she underwent surgery for cancer and complications sent her back to the hospital three weeks later for a second surgery. The recovery was prolonged and difficult and the one joy she would have during this was going for rides in the Miata. She couldn’t wait for me to come home from work so we could take the Miata out. As we cruised the country roads in southern Wisconsin I would catch glimpses of her out of the corner of my eye with her eyes closed and a broad smile on her face, as if in a reverie. She confided to me later that the only time she could forget her pain was when she was riding in the Miata. The next summer, 2010, she was feeling much better and though the evening drives were fewer in number, she enjoyed them just as much. We also participated in a couple of organized tours that summer, one sponsored by Wisconsin and Illinois Miata clubs and the other, a three day event, sponsored by a large, Wisconsin based convertible club. A picture of her that I keep close to me is from one of those drives. She didn’t get a chance to ride in the Miata in 2011. About the time I got it out of storage in March the problems that would lead to her death in June were beginning to unfold. Bi-weekly trips to the hospital for treatments left little time to enjoy such pleasures and, besides, her condition left her feeling too uncomfortable to get in and out of the Miata. As I write this a long, harsh winter seems to finally be releasing its grip and warm spring days will soon be here. Buds are starting to emerge on the trees, early spring flowers will soon be breaking through the soil and my Miata will soon roll out of storage for another summer of spirited drives. 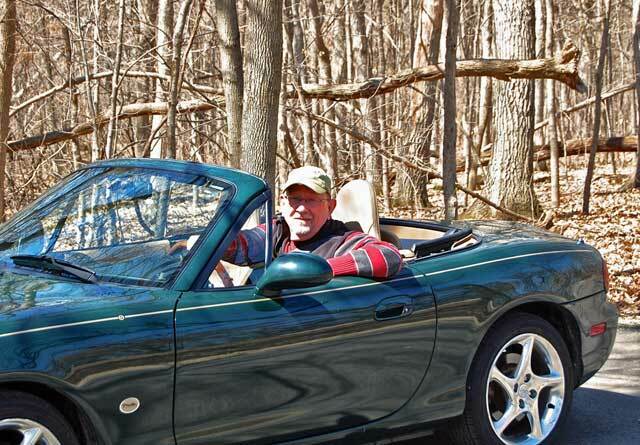 And every time I slip behind the wheel I will think of my late wife, sitting in the seat beside me, smiling, eyes closed, face turned toward the warm summer sun, taking in all the joy that cruising in the Miata can bring. Happy anniversary, Miata. And thank you.